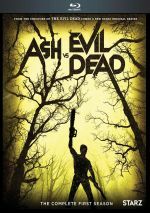 Despite its status as a fan favorite, I guess Starz’ Ash Vs. 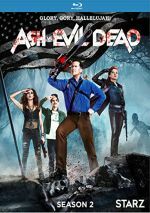 Evil Dead didn’t generate the desired ratings, so Season Three appears to be its last. Will it go out on top? We’ll see via this Blu-ray set. Season Three comes to us here via its 10 episodes. The plot synopses appeared on the series’ official website. The introduction of a wife and daughter Ash never knew existed feels a little desperate. However, “Family” still offers the requisite gory action and opens the season reasonably well. I’m glad to have some new characters, even if the notion of Ash’s wife/kid stretches credulity. Ash’s status as a sperm bank regular offers amusement and a clever fight scene. The rest of “Booth” seems less compelling, but this still becomes a fairly effective episode. Moodier and less comedic than usual, “Dead” manages to thicken various plot elements. It’s not the most entertaining episode of Ash but it comes with some interesting twists. The return of Majors adds charge to “Business”, as he’s a fun aspect of the show. The rest of the show remains plot-heavy but more than watchable. After a more somber start to the season, “Proof” brings back the series’ giddy sense of gory fun, mainly via the confrontation between Ash and his “Mini-Me”. Those scenes fare best, and the rest manages to restore the show’s expected level of nuttiness. The best parts of “Rift” revolve around the epic fight between Ruby and Kelly, as their battle offers good action. The rest of the show feels a bit more stagnant, as it sticks with the less than stellar overall narrative too tightly. Is it possible to dislike an episode in which Ash battles himself? Nope, though I wish “Shout” used this theme more actively. Still, the show advances the plot in a vivid manner that makes it a winner. “Apart” follows a darker than usual path, as much of it takes place in the spooky universe of the rift. It still throws in a bit of comedy, and the mix works well. More than most episodes, “Day” attempts to recreate the vibe of the original Evil Dead movie, and it does well in that regard. It places Brandy in the Ash role and brings us close to the season’s finale in a satisfying way. S3 – and probably the entire series – comes to an explosive close with the action-packed “Mettle”. 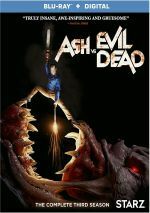 It feels a little like “Ash vs. Godzilla”, but the tone works, and the teaser at the ending delivers a fun look toward future Ash adventures, if any come to exist. I admit I took a while to warm up to the less outrageous tone of S3, but in the end, it works pretty well. We still get plenty of comedy and the more somber feel makes this a solid season. Ash Vs. 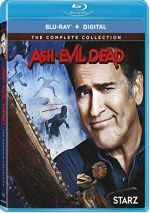 Evil Dead appears in an aspect ratio of approximately 1.78:1 on these Blu-Ray Discs. Once again, the series offers fine visuals. As expected, sharpness worked well. The occasional soft wide shot materialized, but most of the episodes appeared accurate and distinctive. No signs of moiré effects or jaggies occurred, and I saw no edge haloes. Source defects failed to mar the proceedings. Like prior seasons, S3 went for a fairly low-key sense of teal and orange. Some additional hues – like dense greens for supernatural sequences – popped up and the colors seemed well-rendered for the material. Blacks came across as deep and dense, while low-light shots portrayed a good feeling of clarity. As usual, the episodes offered appealing visuals. Lather, rinse repeat: S3’s Dolby TrueHD 7.1 soundtrack closely resembled what I heard for the first two years. That worked fine for me, as the soundscapes opened up in a lively manner. With a consistent mix of action and supernatural material, the audio allowed for a lot of involving sequences. The shows used the soundfields to broaden in a vivid way that used all the channels to put the viewer inside the gory action. Audio quality also satisfied, with speech that seemed natural and concise. Music boasted nice range and clarity as well. Effects added zing to the proceedings, as those elements appeared accurate and dynamic. The audio fleshed out the shows in a pleasing manner. “The Mettle of Man”: Jacobson, Campbell, Carver-O’Neill. Across these, we get info about story and characters, sets and locations, cast and performances, stunts, action and effects. While I enjoyed the commentaries for the first two seasons, these seem less compelling. Even the usually entertaining Campbell doesn’t offer a lot of zing, and we don’t tend to learn a lot about the shows. The best track comes for “Apparently Dead”, and that’s because the directors talk a little smack about Campbell. They don’t dish dirt, but they tell us how he’d yell at people on the set. These tidbits add intrigue and honesty to the commentaries. Otherwise, they’re mediocre. DeLorenzo only appears on four tracks but it feels like she shows up much more, as her cackling and screeching gets old. The others display more tolerable behavior but we just don’t learn a ton. Granted, earlier commentaries didn’t come packed with info either, but they offered more entertainment. Maybe all involved felt depressed by the series’ imminent demise, but these chats are mediocre much of the time. On Disc Two, Inside the World provides 10 clips that run a total of 18 minutes, 29 seconds and includes comments from Tapert, prosthetics co-designers Shay Lawrence and Don Brooker, and actor Quinn Farrell. “Inside” looks at story/character areas, various effects, cast and performances, music, stunts and action, vehicles, sets and locations, and connected topics. Tapert dominates these clips and brings us a good array of notes. The individual featurettes seem too short to deliver many details, but they offer some fun insights. Lastly, Season Overview goes for two minutes, 48 seconds and features Campbell, Carver-O’Neill, Lawless, DeLorenzo, Santiago and actor Lindsay Farris. “Overview” just provides a general preview of the season’s storylines. It’s promo material. As it stands, Season Three of Ash vs. Evil Dead appears to be its last. That’s a shame, as the series kept up a high level of quality and turned S3 into another winner. The Blu-rays bring very good picture and audio as well as supplements led by a collection of commentaries. Ash goes out with a bang via this entertaining compilation of shows.